Stefan Malz has been designing games mostly with his son Louis. Most known games are probably Rococo (with Matthias Cramer) and Edo. Rococo also received a nomination for Kennerspiel des Jahres in 2014. With their upcoming game Valparaíso releasing at Essen SPIEL 2018 they have agreed to let us learn more about their design process as father and son. I’m 50 years old, my son Louis will be 20 years old in a few days. We live in a small place near Braunschweig in Germany. We are developing games as a team since 2008. In my daytime job, I’m managing director of a small software development company creating and distributing CAD software. This depends heavily on the occasion and gaming group. In a group that likes complex games as much as we do, our currently most played games are Terraforming Mars and Altiplano. I personally also enjoy games such as Zhanguo, Nippon, Snowdonia and Gaia Project. In other groups, we enjoy simpler games such as Sarkophag, Mammuz, and Wie verhext. What game would you use to introduce new people to the hobby? Assuming that they have little to none experience with today’s games, I would start with Ticket to Ride, Las Vegas, Metro, or Twixx, depending of the type of game they seem to be interested in. As head of the team for Braunschweig spielt!, our annual gaming convention, I’ve a lot of experience with finding the “best” game for everyone based on previous experiences. What is the most important aspect of playing games for you? Playing games means spending face-to-face time together with other people. Having a good time with various people of all ages. This is something not many other pastimes have to offer. Why do you design games? I started creating my first game as a variant of Risk in the 1980s, created with paperboard and crayons. After my son was born, he was early introduced to classics such as Monopoly and Ludo. As soon as he was in school, we started playing Ticket to Ride, Carcassonne, and much more complex games. When we were extremely bored during the summer holidays 2008, we started to create our first game from scratch and began to contact game publishers in Germany. Once we started that, we both became kind of addicted to it and never stopped since. In general: My son. In terms of game design: Our most successful game Rococo. It was developed over quite many years and had to go through two thematic changes and many discussions with our co-author Matthias Cramer. But the result is great! Unfortunately, it is out of print now and the publisher does not plan to reprint it at the moment. What is the most import part of making a game for you? We design games that we would like to play. So the most important part is to get to a point where we really want to play that game over and over again. Do you usually like to start from the theme or mechanics? I usually start with an idea that includes a bit of both. Having some elements that I would like to include in the game, a possible setting and the desired “feel” of the game. In case of Rococo, the first idea was to create a game featuring craftsmen of some kind. Each player should have “workers” with different abilities such as apprentice, journeyman, and master. It started with showmakers, went on to coffin maker, and ended with tailors. Where do you find your inspiration for new game themes and mechanics? Everywhere. Sometimes in other games (seeing a mechanic that I think could be improved or combined with something else), sometimes in the news, sometimes in my dreams (seriously). What can you tell us about your upcoming game Valparaíso? Valparaíso is our latest development and was our fastest design. It only took a few months from the first idea to a ready-to-be-presented prototype. The first design undertook only a few major changes during the first playtests and remained mostly unchanged since then. During the last year, we changed only tiny details for balancing. In Valparaíso, the main element is the simultaneous, secret pre-planning of your 4 to 6 actions in each round. Once the planning is finished, you have to pay a penalty for changing the actions’ order. But unlike many other games, Valparaíso excuses small mistakes easily by providing alternative actions in case your plan goes awry. 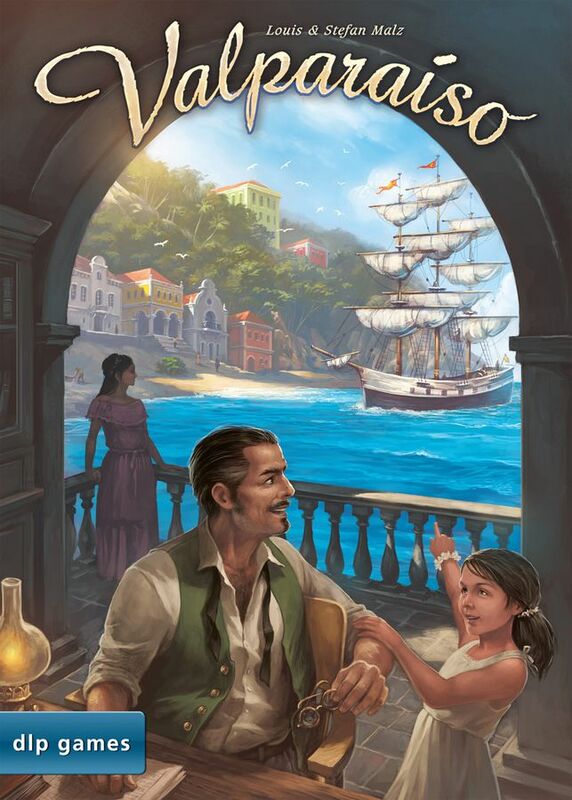 Almost every action performed affects all players by changing the availability of goods and trading options, making Valparaíso a very interactive game without direct confrontation. Our playtests showed that playing Valparaíso can be a very emotional experience!